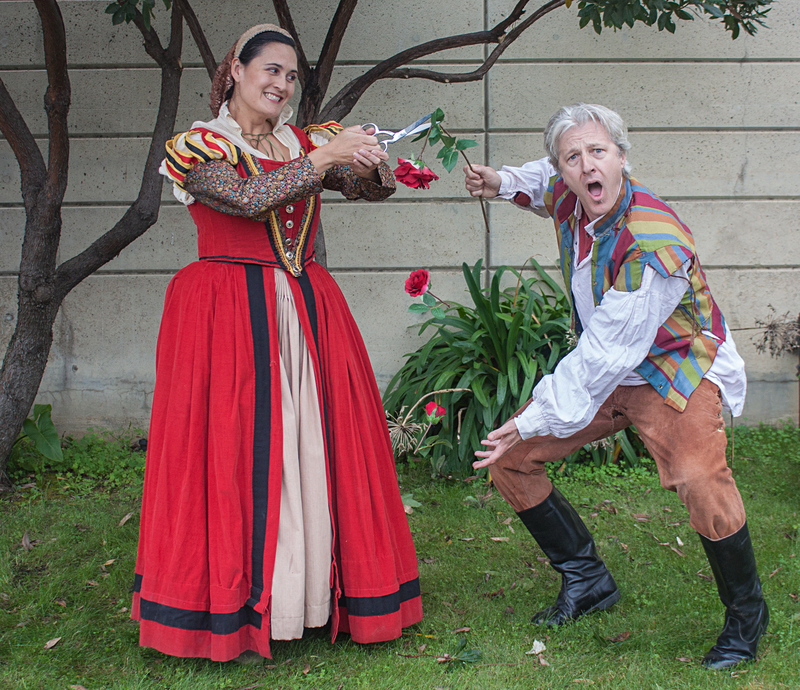 Next week, we go into rehearsal for The Taming of the Shrew, and the season we’re calling The Year of the Shrew kicks into high gear. From the moment when we decided to produce this controversial comedy, I have immersed myself in research of past productions, arguments for and against the play, and my own concerns about how to present it. With this production, I want to reclaim the word “Shrew” and tackle the issues of female dis-empowerment in the play head-on. I hope to find in Katherina a damaged proto-feminist, and in Petruccio a reformed misogynist turned male ally – two prickly outsiders finding their way to each other in a culture full of gender-based expectations. And, of course, I want it to be very, very funny. All this must be grounded in the text – we must find it there, because at the end of the day we want to do the play Shakespeare wrote. Just days away from getting the actors in the room, I still grapple daily with this play. I don’t suppose I will stop grappling at the end of rehearsals, or even on closing night. I ask myself, is it responsible of me as a feminist to produce it? To direct it? To keep it alive in the canon? Or would it be better to let it fall out of favor, a relic of another time? As the Isla Vista murders and #YesAllWomen have reminded us in recent weeks, the violent subjugation of women isn’t some long-distant 400-year-old memory to look back on with laughter. Culture, and how women are represented in that culture, matters. As a woman director who has always loved this play, I feel a responsibility toward it and toward other people who love it. Why does it still fascinate us? Why do women in particular love Kate so much? Ada Rehan as Katherina, 1877. The fact is, this is a sexist play. It’s also not a sexist play, but one that subverts its own genre. Understanding and appreciating Shakespeare, to me, means being able to hold two seemingly contradictory ideas at the same time. Shylock is a villain and a victim. Hamlet is indecisive and a man of action. Macbeth is powerful and weak. Shakespeare was never interested in two-dimensional characters or situations, and I believe we do him a disservice if we don’t pay attention to what he’s saying around the edges of the genre. He was a commercial playwright who had to write for an existing audience, and at the same time he was doing things no one had ever attempted before. The fact that he remained so commercially successful in spite of his groundbreaking innovations astonishes me. The Taming of the Shrew reflects its time, a time of many contradictions, in which gender roles were in flux. There was a woman on the throne, and according to the Divine Right of Sovereigns, she was infallible. At the same time, husbands had their own divine right, to punish their wives for perceived crimes without trial or explanation. How could one woman be all-powerful while the rest were lesser humans? Add to this a new idea of the time that marriage should be based on mutual love and respect, along with the rise of women holding property, engaging in business dealings, and getting involved in local politics (for a terrific book on the real life of women of the period, see Germaine Greer’s Shakespeare’s Wife). 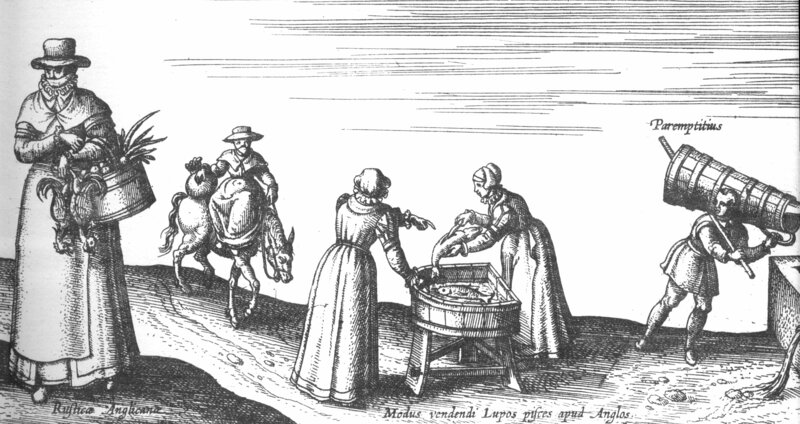 All this resulted in cultural shifts around gender roles in the 1590’s that sound pretty familiar to us even in the 21st century. To spare you having to read through it, here’s the gist: A wealthy man has two daughters of marriageable age. The youngest is mild, sweet, and sought-after, and the eldest is “shrewish” and violent. A young fortune-hunter comes to town and marries the eldest, planning to “tame” her. 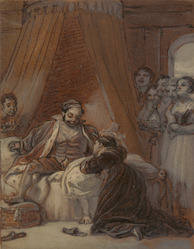 The marriage is marked by mutual violence – he beats her, she beats him back, until he finally kills and flays his old horse Morel, beats his wife until he draws blood, then wraps her in the horse’s salted hide until she agrees to obey her husband and demonstrate wifely behavior at a public feast. As usual, Shakespeare didn’t adhere slavishly to his source material. 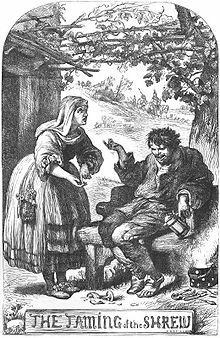 He used the basic plot of this and other Shrew folktales – a brash young suitor arrives to marry a shrewish older daughter – but subverts it from the start with an unusual structural choice. 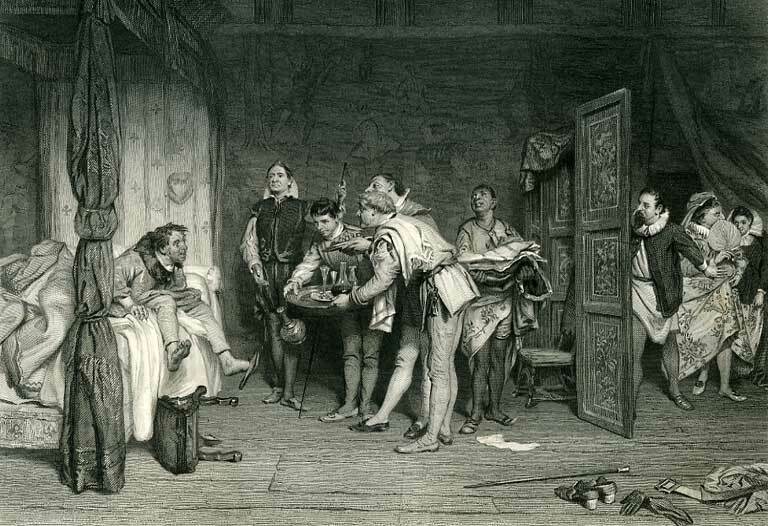 He uses a framing device, or Induction, set in an Inn, where plays were frequently performed in provincial towns like Shakespeare’s Stratford. 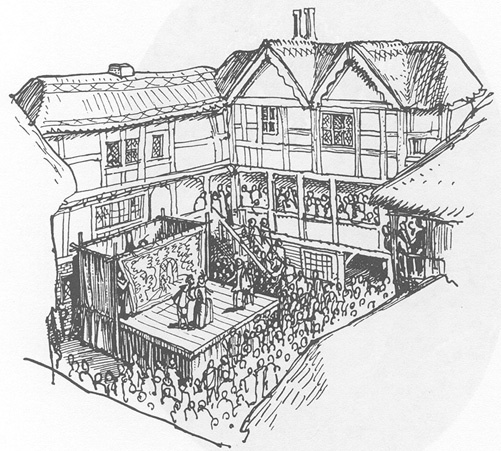 A modern rendering of an Inn Yard stage. The first characters to appear are Christopher Sly and the Hostess. Sly is a drunken beggar, a lower-class, powerless male figure. In the first moments of the play, he is scolded by the Hostess, a female business owner, for breaking her glassware. He boasts of his ancestral privilege, insults her, and then passes out at her feet. “Sly. I’ll pheeze you, in faith. 1st Woman. A pair of stocks, you rogue. Here we have what might be referred to as a male Shrew. 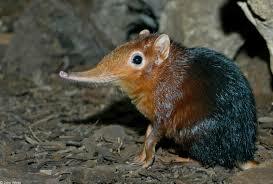 An elephant shrew, arguably the cutest of the shrews. What’s a Shrew? In the animal kingdom, shrews are small vicious rodents, originally believed to have a poisonous bite, who squeak loudly – they’re kind of cute if you find the right photo. According to Barbara Hodgdon’s excellent introduction to the Arden Shrew, “by the mid-thirteenth century ‘shrew’ had come to mean a wicked, ill-disposed, or malignant man’, a definition which by the end of the fourteenth century had expanded to refer to the devil.” This description seems more fitted to Iago than Katherina. By Chaucer’s era, the definition could refer to either gender, and by Shakespeare’s, women had taken on the name almost exclusively. It’s clear to me what Shakespeare was doing here. His audience arrives expecting a Shrew play, and in the very first scene he gives them something unexpected – a male character exhibiting the traits of a Shrew. The hostess with Christopher Sly. 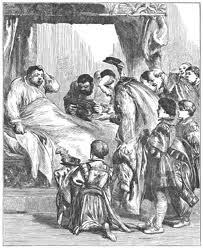 A Lord arrives at the inn and discovers Sly passed out on the stage. He mocks the drunkard, but then proposes “killing him with kindness” – bathing him, offering him food and drink, clothing him in silks and dousing him with perfume – mostly for his own amusement, but also seemingly as a sort of social experiment. “Lord. Oh monstrous beast, how like a swine he lies. Friends, I will practice on this drunken man. I like to think of this tactic as the “Opposites Game” – treating someone in the opposite way they might deserve or expect in order to change their behavior. Sly awakes, by William Quiller Orchardson. Sly wakes to the sound of beautiful music and servants waiting on him hand and foot. Treated as a lord coming to himself after a long madness, Sly begins to believe he’s a lord after all. Sly. Am I a Lord, and have I such a Lady? Or do I dream? Or have I dream’d till now? Believing he’s a lord, he starts to behave like one, switching from slang-filled prose to a pretty good imitation of the Lord’s evenly-paced iambic pentameter verse. Presented with a group of actors who wish to perform a play for him, as well as a young male page disguised as his long-lost wife, he starts to abandon his rude and socially unacceptable behavior and behave in a way commensurate with how he is treated. The Amazement of Christopher Sly, 1882. In our production, the Induction will be set not in a Warwickshire inn, but in a place as homey and comfortable to us as Stratford was for Shakespeare – at a present-day performance of Free Shakespeare in the Park. The Lord will be played as an educated, upper middle class young female house manager dealing with an unruly interloper, with the assistance of her largely female staff. Sly with the page dressed as his wife. The Induction introduces both the Opposites Game (later used by Petruccio with Katherina) and the central theme that all gender-based behavior is in fact a performance, one we engage in to get along in society. In addition, in the mock marriage of Sly and the young man, it’s possible to see marriage as an arrangement that benefits men in which women are outsiders. Stock characters of Commedia dell’Arte. As Sly and his “wife” watch, the Players enter and perform the first scene of Shrew, in which we are introduced to numerous Commedia Dell’Arte archetypes (the kind Shakespeare may have also seen in his Warwickshire youth) engaged in a fairly standard romantic comedy set-up. We have a Pantalone figure (Gremio), the young Innamorati (Lucentio and Bianca), the clever Zanni (Tranio), and as well as a befuddled father (Baptista) and a foolish suitor (Hortensio) – and then the actress playing the house manager appears again, this time as Katherina the Shrew. Like Sly, she is noisy, rude, inappropriate, and violent – perhaps demonstrating to Sly the affect of such behavior on others. At this point in the Induction, Sly, still a bit worse for drink, dozes off, and it’s the last we read of the character in the First Folio version of Shrew. This, of course, leaves tantalizing questions – what happens to him and the other Induction characters? Are they still on stage? In the Anonymous play The Taming of A Shrew, which may be an earlier source for Shakespeare’s play, a first draft, or even a “bad quarto” pirated from live performance, Sly interjects throughout the action. But in Shakespeare’s version, he disappears. 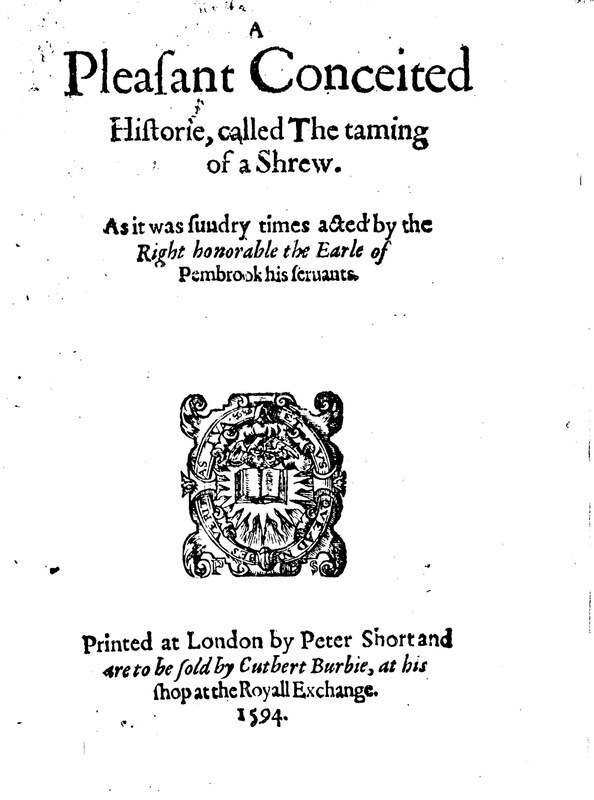 The title page of The Taming of A Shrew, 1594. In our production, he goes to sleep… and imagines himself as the suitor to this powerful, unruly woman Katherina. Perhaps at first he’s having a wish-fulfillment fantasy, imagining himself the sort of man who can tame her. Or perhaps he’s out for revenge against women after his treatment by the Hostess. 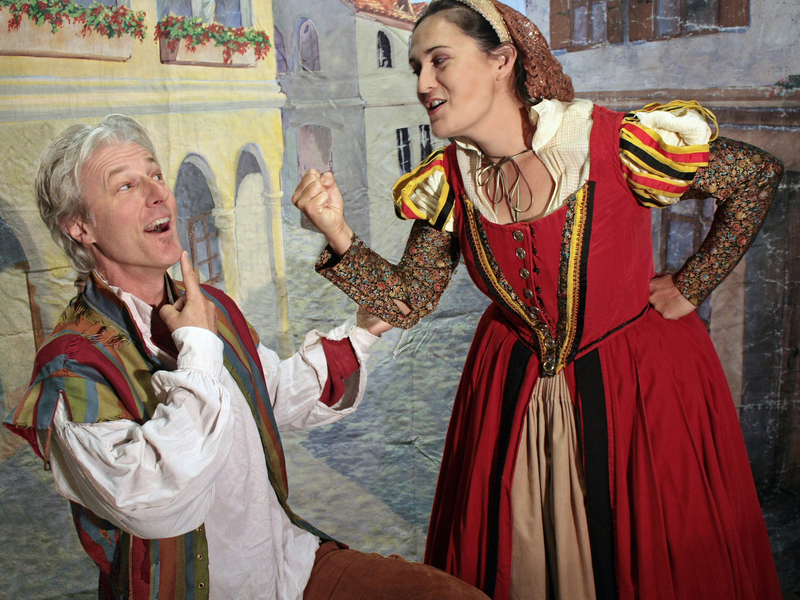 He certainly enters the play cocky, boastful, and arrogant, very much the Il Capitano archetype of Commedia. But the tactics he uses are not those of the “Merry Jest” ballad – he doesn’t engage in violence of any kind. Throughout the play, the text never indicates that he lays a finger on her. Instead, he uses the Opposites Game – the more Katherina abuses him, the more he praises her good behavior. He gives her the kind of respect her father and the other men in the play have never given her, even when she responds with physical violence. As they continue to interact, they are clearly equally matched, and by Act Two, if we do our job right, the audience will be rooting for them to get together. Katherina makes short work of a gift from Petruccio. This essay is the first in a series in which I’ll share some of my thoughts on the text and how we’ll deal with its thorniest corners. I may see the play one way in my head, but everything changes as soon as the actors are in the room. I look forward to sharing our journey with you.